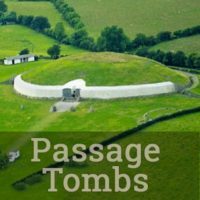 Drag within the image to explore the Kilclooney Dolmen in virtual reality. 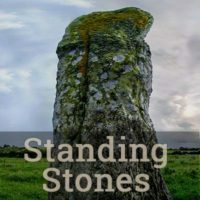 In his brief discussion of the Kilclooney Dolmen and its environs, R. Æ. Baillie concludes that, with their history lost, “…it must ever remain a mystery how those huge stones were lifted up and carried, often considerable distances.” But perhaps the biggest mystery about this portal tomb is why there is a miniature dolmen doppelgänger, with its capstone on the ground, only 5 m (16.5 ft) away. 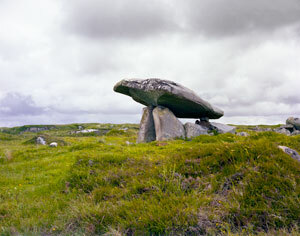 The landowner, interviewed in 1979, said that the top of the miniature dolmen was removed around the turn of the century (1900) during a melee involving “a group of tinkers who were camping on the site.”2 In the virtual-reality environment, left, a hotspot connects the main Kilclooney Dolmen with its smaller neighbor. 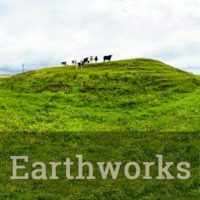 Archaeologists believe that both of the portal tombs may once have been covered by the same east-facing cairn, some traces of which may still be seen. 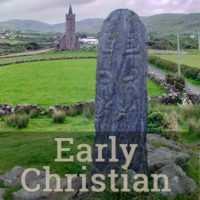 However it is also possible that the two were constructed in the Neolithic era hundreds of years apart. William Borlase wrote after visiting the site in 1897: “I think it beyond doubt that a covered passage led to the structure from the E. side.” Borlase also reported seeing “two indentations, possible cups [cup marks] on the upper surface of the covering-stone…”3 Contemporary writers have not noted these cup marks. The high-resolution photograph (below, right) was made with a large-format view camera in 1979. Click the photo, and then click the button at the right of the Zoomify toolbar to see it full-screen. Archaeobotanical studies in the area of these two portal tombs have suggested that the period of their construction coincided with an era of woodland clearance and the initial development of Irish agriculture. 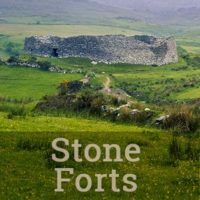 The builders of these megaliths may have sited them in close proximity to where they lived and farmed.6 Relatives of these Neolithic farmers may have constructed the court tomb that sits 500 m (1,640 ft) to the east of the dolmens. 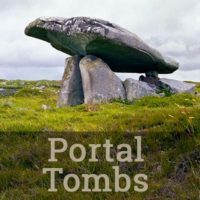 It is clear that this dolmen, as other portal tombs, can be seen as a monumental shape-shifter, suggesting visual allusions, or acting as a megalithic Rorschach Test. 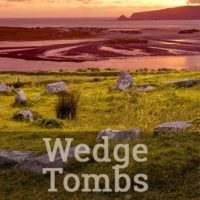 In order to simulate this experience for the website visitor, we’ve created the means to view the Kilclooney Dolmen from all angles. Click on the image, below left. Then, after it opens in a floating window, drag to rotate the view of the dolmen. 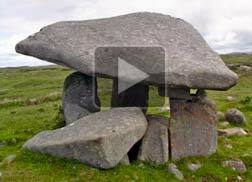 Click for a view of the Kilclooney Dolmen from all around it. 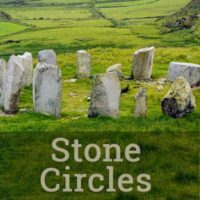 “There is a big stone standing in a field over in the townland of Fal Garbh. People call this big block of stone the Stualaire [high stone] of Fal Garbh and it is said that itself and the land round about it are gentle [belonging to the fairies] and that it is not right to interfere with it.